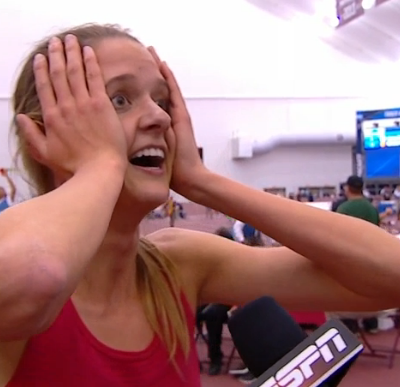 BIRMINGHAM, Ala. — Ohio State’s senior Julia Rizk and NAU junior Geordie Beamish of New Zealand pulled off upsets tonight to win the mile races at the 2019 NCAA Indoor Track and Field Championships. Rizk, the Big Ten runner-up in the mile two weeks ago who had never run in a final at a NCAA track champs before (she was 15th in the outdoor 800 in 2017 while at UCLA in her only other NCAA appearance), was passed by 2017 NCAA mile champ Karisa Nelson of Samford just before the final turn but Rizk didn’t panic. She waited until the homestretch to respond and retake the lead and pull away to the title in 4:37.64 thanks to a final 400 of 61.47 and final 200 of 31.07. Nelson ended up second in 4:38.24. The #1 seed, Big 10 champ Hannah Meier of Michigan, was a total non-factor over the final 400 and ended up last in 4:45.80. Arkansas, chasing the women’s team title, had two women in this event seeded in the top 6 but only got four points as junior Carina Viljoen was 5th (4:38.51) as redshirt freshman Lauren Gregory was just 10th (4:42.94). It didn’t matter in the end in the team scoring, as Arkansas wound up winning the title anyway. In the men’s race, Beamish, who has just a 4:06 mile pb (but a 3:41 1500 pb) and had never been to NCAAs on the track before, made a big move just before 300 meters remained to grab the lead. Heading into the bell, pre-race favorite Oliver Hoare of Wisconsin, the 2018 NCAA 1500 champ and the #1 seed this year thanks to the 3:54 he ran at Millrose, tried to get the lead, but Beamish held him off. Hoare and Beamish, one Aussie and one Kiwi, ran side by side for entire first half of the last lap, but Beamish refused to let Hoare get by. On the final turn, Beamish started to pull away and victory was his in 4:07.69 after a 53.58 final 400 and 26.18 final 200. Hoare ended up third in 4:08.14 as Villanova’s Casey Comber moved up to second in 4:08.03 just before the line. Geordie Beamish may have the most unlikely resume of any NCAA mile champion. Start with his PR: 4:06. “That must be the slowest PR of all time for a mile winner,” Beamish said. Then factor in that this was his first appearance at an NCAA track championships, and that he was running 400-meter repeats in 67 seconds just three weeks ago. But Beamish’s kick was there when he needed it today in a race that featured the slowest winning time since 2006. The fact that Beamish is even in the mile at all is something of an accident. He ran 4:06.96 in the mile at an NAU home meet on February 2, which was worth 3:57.99 for NCAA qualifying purposes after the altitude/flat track conversions were applied. But his plan was to qualify in the 3k at Iowa State the following weekend and run that event at NCAAs. The morning of his 4:06, Beamish found out that he had a stress reaction of his foot, and his only run on solid ground over the next three weeks was his 7:56 3k at Iowa State — not good enough to qualify. If he wanted to run at NCAAs, the mile was his only option. Injuries are nothing new for Beamish. “This is my 11th season as a Lumberjack and I’ve been injured in all 11 of them, maybe five of them season-ending,” Beamish said. Now Beamish, who finished 40th and 39th in the last two NCAA XC champs, is an NCAA champ in the mile. But he’s still not sure it’s his best event. We asked him: do you consider yourself a miler now? While there were many athletes pulling double or triple duty at NCAAs this weekend, perhaps no one was more exhausted at the end of the meet than Wisconsin’s Ollie Hoare, who ran the mile prelims and 1200 leg on the DMR on Friday and the mile and 3k finals today. His best result was a third-place finish in the mile, and while he wasn’t happy to get outkicked by the Kiwi Beamish (Hoare is Australian), admitting that Beamish “kicked my arse that last 200,” Hoare said that the defeat makes him more excited to come back outdoors, where he will try to defend his 1500 title. Hoare has been a bit under the weather this week, which perhaps explains why he didn’t look quite as sharp as he did in June when he won NCAAs. But he said that he didn’t regret taking a chance to help his team do something special, and ultimately the 8 points that Hoare contributed (2 in the DMR, 6 in the mile) helped Wisconsin earn a trophy as they tied for 4th with Stanford. We also had a chance to speak with Byrne after the meet and asked him why he decided to run Hoare on the 1200 leg of the DMR last night. Byrne explained that given that Hoare was a little sick, he didn’t want to put him on the 1600 leg with the mile final coming up on Saturday. But he still felt that Wisconsin could score some points with Olin Hacker on the anchor leg and felt that putting Hoare on the 1200 leg would increase their odds. And ultimately that may have proved crucial: Wisconsin got two points in the DMR and wound up tying for the final podium spot as a team. Who knows if they get those two points without Hoare? Like Beamish, Rizk is not someone anyone would have picked to win the NCAA mile title at the start of the season. Though she did finish 3rd in the Big 10 1500 last spring, she was 10th in her heat at the NCAA East prelims and did not come close to qualifying for NCAAs. 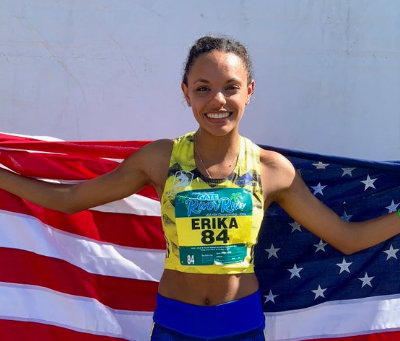 Before that, she was primarily an 800 runner — she made NCAA outdoors in that event in 2017 for UCLA — but began to focus more on the 1500/mile after transferring to Ohio State to be closer to home. Even this season, progress was gradual. Heading into the Big 10 indoor meet, her PR was still just 4:42, but she was towed to a big 4:32 PR by Hannah Meier in that race and entered NCAAs as the #2 seed. 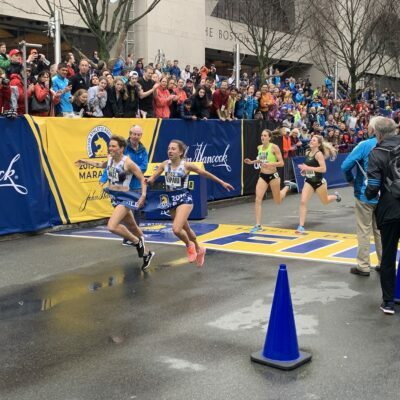 Now she’s the national champion, and while Rizk was still in shock after the race — she described her immediate post-race thoughts as “Is this reality? It feels like a dream. I’m the national champion, right?” — she said that the belief of her coach, American 800 legend Khadevis Robinson, helped convince her an NCAA title was possible. But the fight she showed in the final straight to re-take the lead for good? That was all Rizk. Nelson obviously wanted to be first today, and said that in retrospect, she wished she could have moved just a little later than she did. But she also acknowledged that that still may have not been enough to win. As it was, Nelson ran out of gas in the final straight, giving Rizk the opportunity to run her down. “My legs were pretty toasted and I think my form fell apart,” Nelson said. Talk about the race on our world famous fan forum / messageboard.